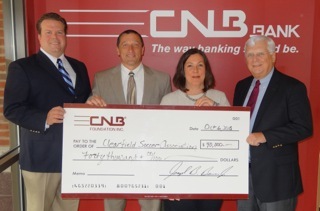 CLEARFIELD – CNB Bank presented a contribution to the Clearfield Soccer Association in the amount of $40,000. Presenting the check is Joe Bower, CNB Bank president and chief executive officer, and receiving the contribution on behalf of the Clearfield Soccer Association is C. Alan Walker, Andy Spencer and Lisa Soult. CNB Bank pledged $10,000 per year for four years to support improvements to the Clearfield Soccer Complex. Improvements include electricity, upgrade of septic systems, improvements to the access road and parking areas, as well as additional storage for lawn care equipment, designated handicap parking and a pavilion expansion. “We have been a big supporter of the Clearfield Soccer Association and the opportunities it has provided the youth in our community,” states Bower. The Clearfield Soccer Association received grants totaling $160,000 to help fund the improvements that require dollar for dollar matching funds. The purpose of the capital campaign is to raise the $160,000 needed to move these projects forward. Last Chance: Win Tickets to Oktofurfest!